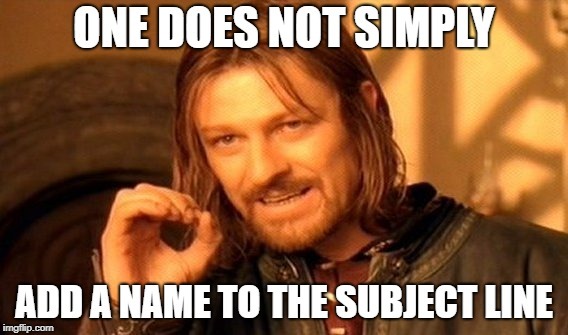 Blog / Beyond a Name in the Subject Line: What Is Email Personalization? What if your email subscribers enjoyed getting your emails? Not just tolerated them as the way to get an occasional deal (or worse, gave you their email address in exchange for gated content and never got around to unsubscribing)? What if they actually looked forward to seeing your name in their inbox? Too good to be true? Not necessarily. There are plenty of email marketing best practices that can boost subscriber satisfaction, but the one with the most potential for long-term growth is effective personalization. The first thing most marketers think of when they hear “personalization” is putting the recipient’s first name in the subject line or the copy of an email. While that is technically personalization, it’s all too often just superficial. Showing you know your subscribers’ names doesn’t mean you know them, any more than reading someone’s name off a name tag at a convention means you’re best friends. So, what is personalization then? There isn’t one way to define or create personalization, but the result should give each subscriber the feeling that the email they received was individually crafted for them. 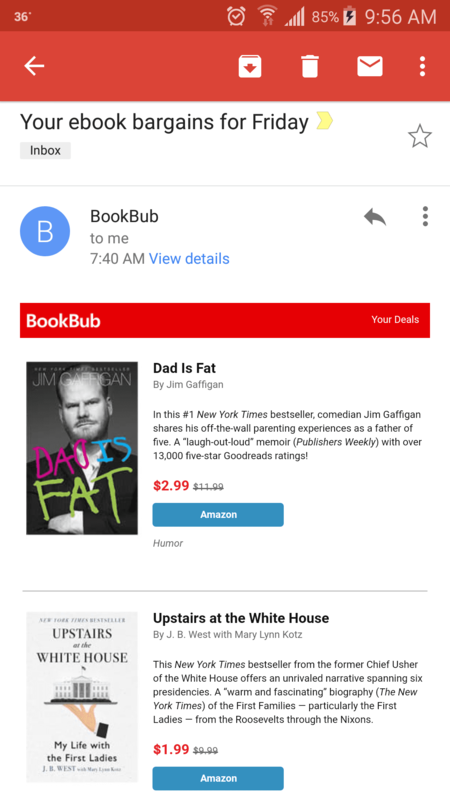 One of my favorite examples is a site called BookBub, which sends daily updates on discounts and new releases for books you might like. Not every book they recommend is something I’m interested in, but virtually every email has one or more books that I might want, and that keeps me opening their emails. While this example isn’t from my personal email, one of my colleagues received some recommendations based on interests in non-fiction, biographies and humor. In my previous role in ecommerce, one of my favorite strategies was looking at products that were on sale and finding customers with those products on their wish lists. It’s a very simple way to personalize, but one that always brought great return on investment. Email personalization can be technically sophisticated, such as using dynamic content to swap out elements of imagery, copy, links, etc. based on subscriber information. Or it can have a simpler approach, like segmenting your audience so that email A goes out part of your audience, email B goes out to others, and so on. Whether you’re using the most advanced dynamic content techniques or crafting individual messages for each segment, you need to know your subscribers to personalize effectively. That means not only having good data on your subscribers, but also analyzing that data to determine what kind of message will resonate with different types of subscribers. Some data points you can consider include purchase history, abandoned carts, browsing behavior, and answers to survey questions – but almost any data is potentially useful. Going back to the BookBub example, they asked me to pick a handful of favorite authors and genres, and then used that information to recommend books. Spotify is another company that does a good job personalizing emails. Subscribers get regular messages letting them know about new music releases from artists they’ve listened to, or concerts coming up in their area. 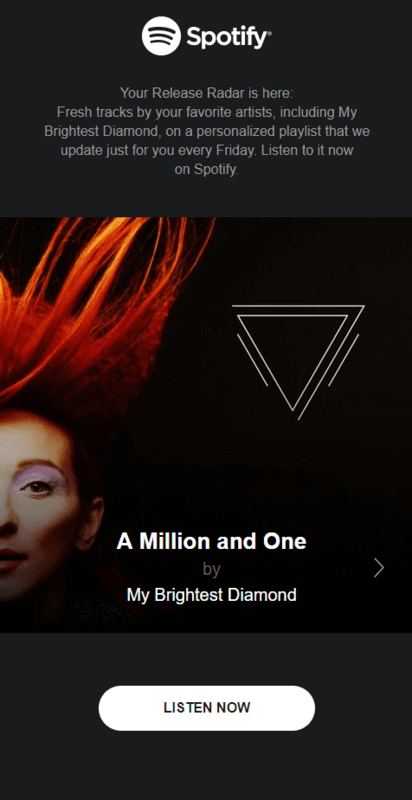 Spotify personalizes emails based on music the subscriber listens to. Data management is foundational to personalization. If you want to personalize email, your relevant data needs to be accessible in your email system. That might sound obvious, but I’ve seen many cases of data being siloed in a way that makes it effectively non-existent for email purposes. It’s also important to consider what data you don’t have but might be able to collect. The nuts and bolts of data management is a whole other topic, but it’s something you have to think about before you start developing personalization strategies. Does this email I’m sending make sense for my entire subscriber base, or is it relevant only to a subset? If the email is appropriate for the entire base, is there a section or call—to-action (CTA) that can be personalized? Are there segments of my subscriber base not currently receiving relevant messaging? Is there customer data (purchase history, browsing behavior, survey answers, etc.) that can inform more customized messaging? Are there specific emails that are performing very well or very poorly with certain segments of my subscriber base? What insights can I gain from these messages? Looking for some inspiration? There are a number of great examples online, including these 13 compiled by HubSpot and another eight curated by Campaign Monitor. If you’ve got some good examples of personalized emails you’ve received (or sent yourself), share them in the comments! In the end, personalization is about making sure the right message gets to the right people, rather than trying to get a predetermined message out to as many people as possible. It takes investment in time and resources, but it’s an investment that can bring better results in all email marketing metrics. And maybe it can change the way your subscribers think about your emails.